Have you heard about the health benefits of kombucha? Or you just love to drink kombucha? Either way, in this guide we will help you find the right kombucha fermentation kit to get you started brewing your own kombucha. We introduce a range of different starter kits from basic kits suitable for new fermenters to the high-end kits suitable for families and fermentation enthusiasts. Our aim is to help you make the best decision based on your needs taking into consideration the quality and cost of the product. Before we review different fermentation kits let’s give you a quick glance of what is kombucha and the benefits of kombucha. Is it Worth Making Kombucha at Home? How to Choose a Fermentation Kit? Kombucha is a sour beverage produced by fermentation of bacteria and yeast in a sugar tea solution. Combination of bacteria and yeast is called SCOBY which stands for Symbolic Culture of Bacteria and Yeast. Kombucha is a simple and healthy beverage made of SCOBY, tea, sugar and water. With a just four simple ingredients you get to enjoy fizzy and delicious drink. Keep in mind kombucha is not a sugary drink like a soda or a soft-drink. During fermentation process SCOBY feeds of sugar hence we do not consume the sugar. Kombucha tastes slightly sweet and slightly tangy. Its flavor depends on type of tea used and the brewing process. Kombucha can be flavored by adding fruits, herbs and spices and this process is called second fermentation. Kombucha is is also seen as a powerful probiotic responsible for our gut health. It helps us balance good and bad bacteria in out tummy. We will discuss further health benefits of kombucha towards the end of this post. Two main reasons for making kombucha at home are saving money and the ability to enjoy the experience. Making kombucha at home is more affordable as you will be saving an average of $4 per bottle. 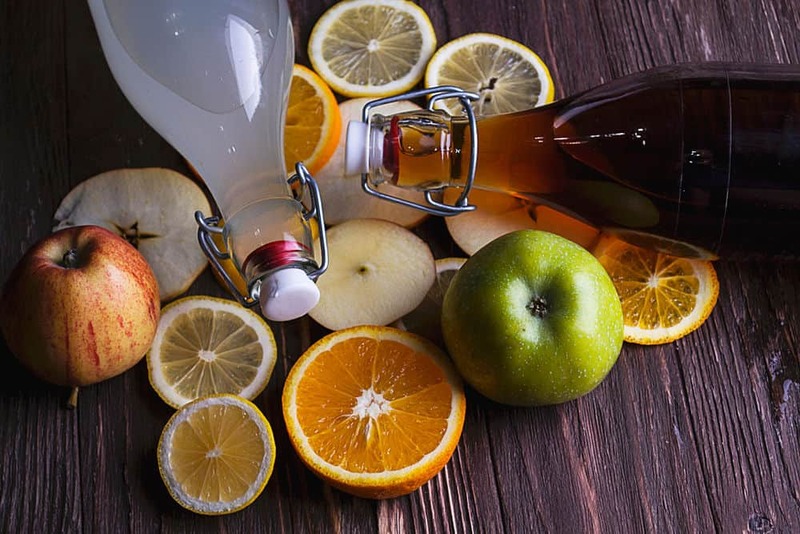 Demand for kombucha increased dramatically since 2015 which contributed to increased supply of kombucha and greater product range not just in health stores but across all supermarkets and smaller food stores. High demand of kombucha keeps the prices firm. 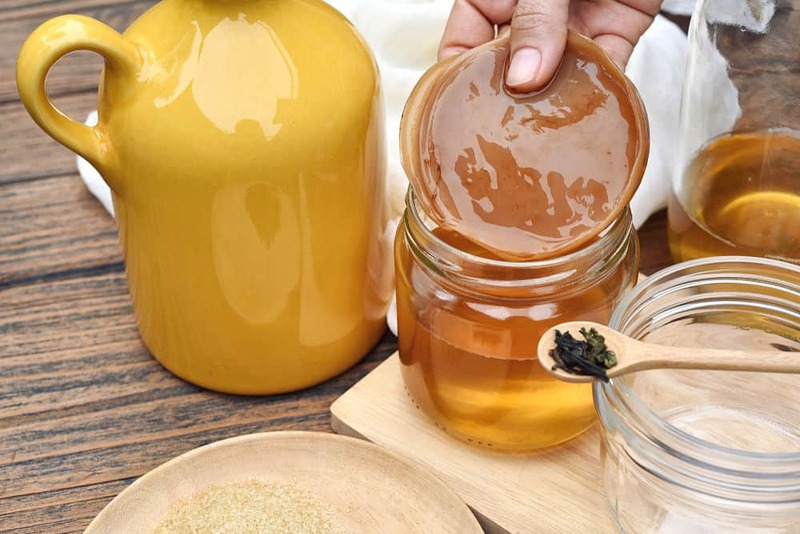 By making kombucha at home you will get to enjoy the process and get to see how over a few days SCOBY starts to grow and kombucha flavor changes. You also have an opportunity to experiment with different kombucha flavors and make your desired flavor. Choosing the right fermentation kit can be challenging especially if you are new to fermenting food. Fermentation kits are a great way to start fermenting as they give you all you need for your first batch. Kits are designed to allow you to place food in glass jars, load them up with ferments and wait until nature takes its course. do you just want to get started with a simple and cheap equipment then upgrade if you start to enjoy the taste of the fermented food. We want to make kombucha brewing process at home as easy as possible for you. 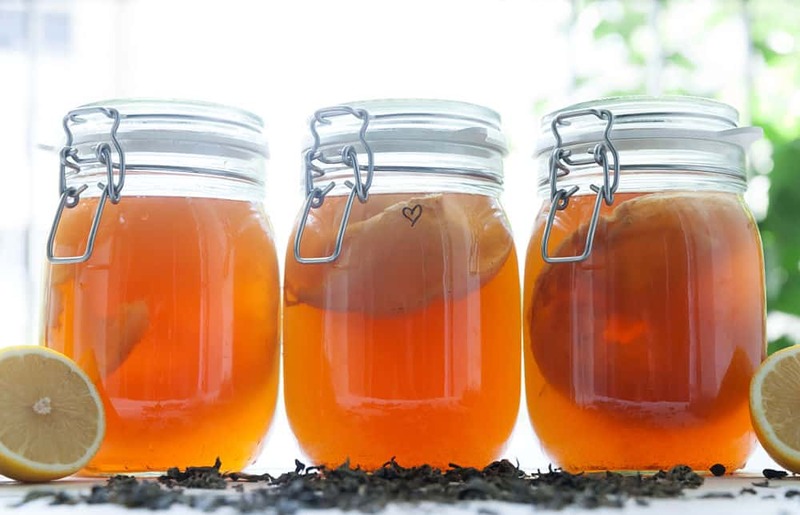 We have put together a list of the best kombucha brewing kits. These kits come with everything you need including the starter culture and all supplies. You will have everything you need to make your first batch and in most cases a few more consecutive batches. We put the below table together to help you with your decision making process. Essentials include all ingredients and supplies you need to make kombucha at home. Optionals lists extras that are not required for making kombucha but are required for storing kombucha when it’s ready to be consumed. You are more likely to have Optionals already in your kitchen pantry. If you don’t, you still have time to get them as they are required during kombucha bottling phase which is usually 5-7 days from the start of the process. 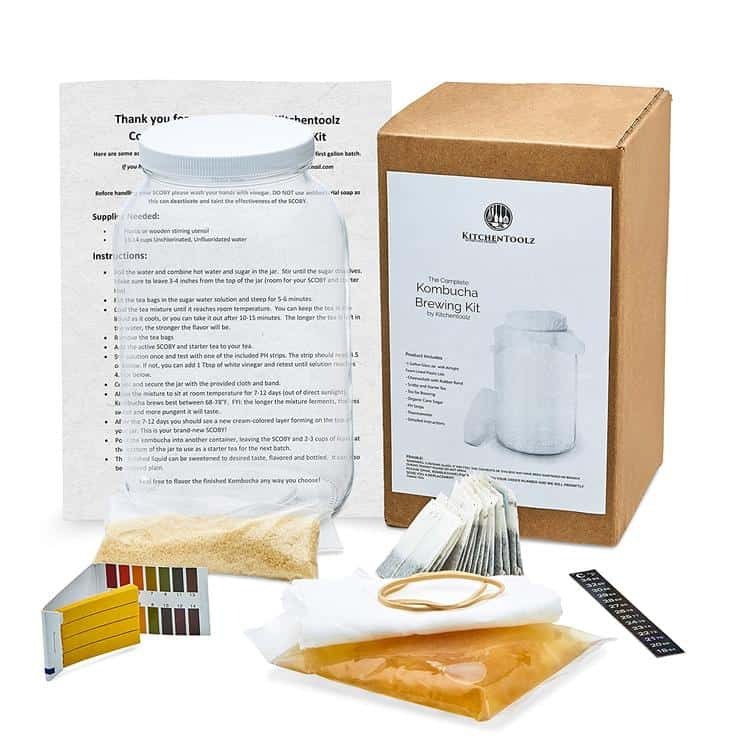 This kit includes All Essentials you need to brew your own kombucha straight from your kitchen. The kit does not include glass bottles to store your ready to drink kombucha. You may use any glass bottles you have in your kitchen pantry regardless of size as they are only used to store kombucha. If you prefer cool-looking bottles you may want to get glass bottles with swing top. equipment and starter culture can be reused for subsequent batches. 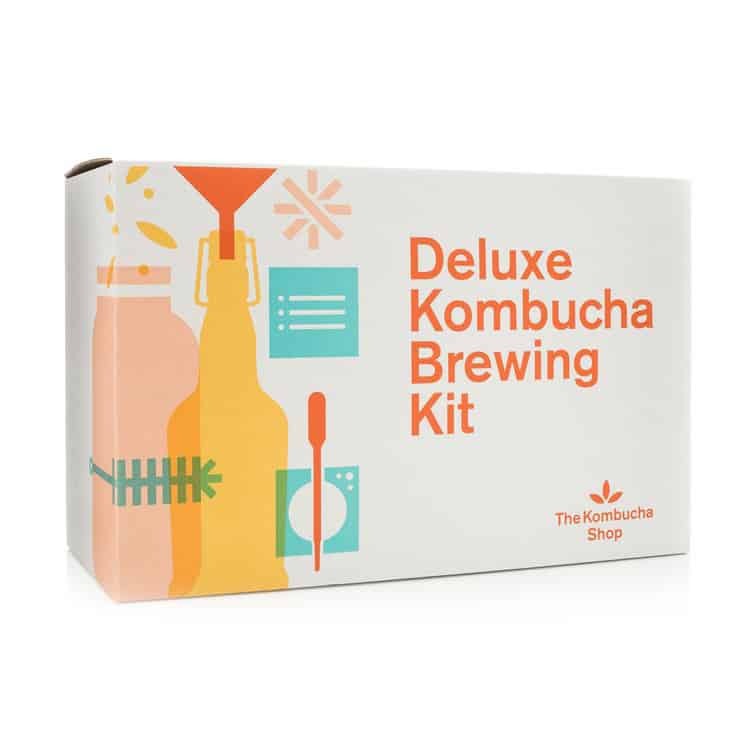 This kit comes with full step by step instructions on how to make your first batch of kombucha at your kitchen counter. It is a simple kit where most Essentials are included apart from brewing jar and no Optionals are included. This kit is suitable for those that have glass jar and bottles in their kitchen pantry. 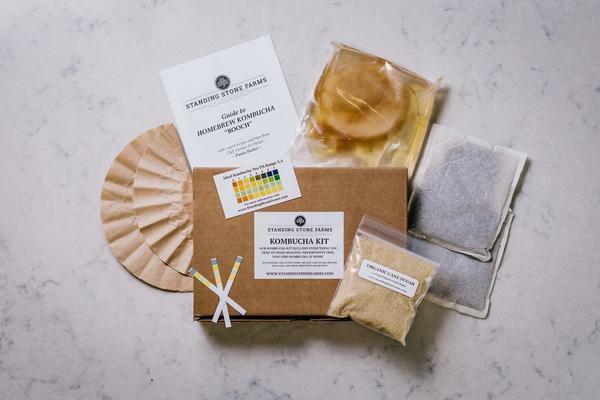 This kit includes All Essentials you need to make your first batch of kombucha at home. Manufacturer states that the kit includes custom kombucha tea blend which is specifically formulated to keep the culture happy and nourished. Tea mix includes combination of loose leaf green and black tea which provides a balanced diet for SCOBY and allowing it to ferment in peak conditions. This is a perfect kit to make your first batch of fizzy and delicious kombucha. The kit includes everything you need to brew and bottle kombucha at your kitchen counter. It comes with All Essentials and All Optionals. In addition, pippet staw is included so you taste your kombucha along the way to see how close to ready it is. The kit also includes bendable bottle brush which helps you reach those hard to reach bottle corners when washing glass bottles. The only things not included are water and patience, otherwise, you are set to make your homemade kombucha in 5-7 days. Post-Brewing Guide (16 pages long) to help bottle your kombucha, experiment with different flavors and care for your kombucha culture. This is another kit made by Get Kombucha company. 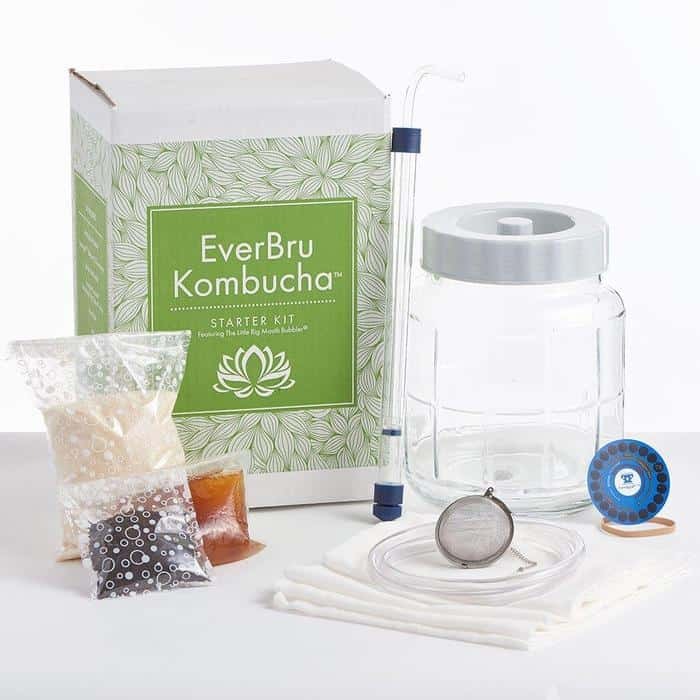 In comparison to the kit by the same company outlined earlier, this kit includes all Essentials including a premium kombucha continuous brew kit system. It comes with 2.5 gallon porcelain brewing vessels with wood brewer stand. This is a high-end kombucha brewing kit designed for families and kombucha enthusiasts who want a constant supply of kombucha. The brewing vessel comes with spigot which allows easy transfer of kombucha tea into bottles for storage. This kit includes most Essentials apart from ph test strips which measure acidity level. It includes extras like stainless tea ball and a mini siphon. Having siphon is handy as you can use it to transfer kombucha batches into bottles. 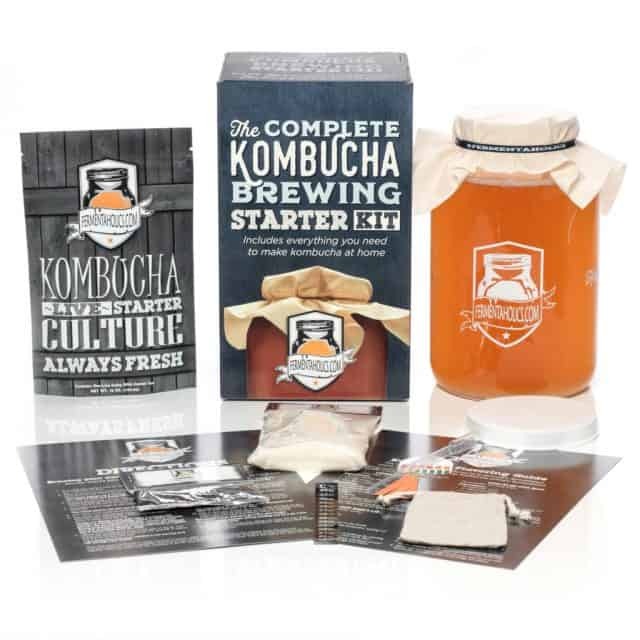 This is a simple and perfect get started kit as it includes all essential ingredients like SCOBY, black tea and sugar to make your first batch of kombucha. Most other Essentials are included like ph chart, ph test strips, elastic jar bands, jar covers and comprehensive instructional booklet. Note: you will need to supply your own brewing jar and glass bottles. 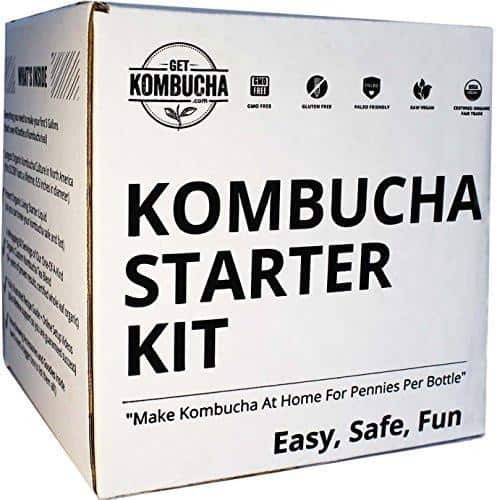 We have reviewed five different kombucha starter kits. Overall, they are all great and definitely adequate to get you started making kombucha at home. 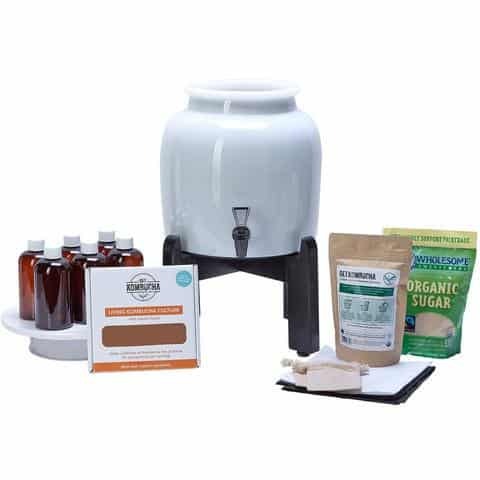 Comparing all kits based on their features and considering value for money component our choice is the Deluxe Kombucha Brewing Kit. The main reason that influenced our decision is that EVERYTHING is included in this kit – all ingredients and all supplies. The kit includes good quality supplies and has a high rating by majority of reviewers. This is also an affordable kit as its moderately priced comparing to other kits and their features. An old saying states “You are what you eat” which might be debatable for some. However, most of us will agree with we live in the world where we follow typical processed food diet where the convenience is the most important factor in meal preparation. Kombucha is a naturally derived probiotic which comes with many health benefit. Like every drink and food, kombucha should be consumed in moderation. 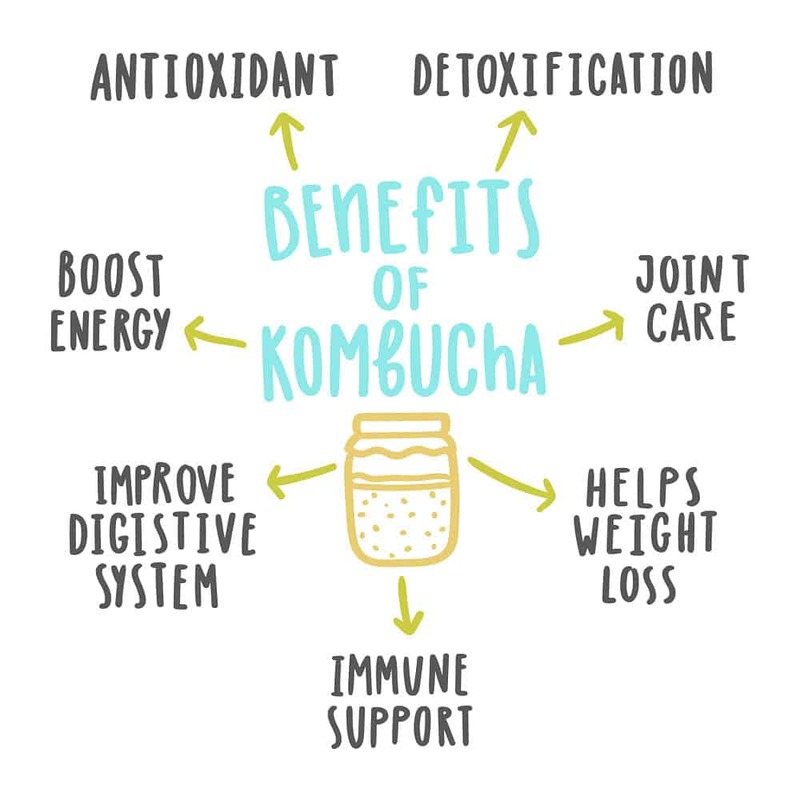 We outline some of the main kombucha health benefits below. Around 70 to 80 percent of our immune system is located around our gut and for those that have digestive problems they are likely to have weakened gut. Kombucha tea contains many probiotics which can help you balance good and bad bacteria and keep your immune system strong. Kombucha is a natural probiotic which contains energizing vitamin B and iron. Instead of having a coffee or other caffeinated drink, you could try drinking kombucha to naturally increase your energy levels. Kombucha contains acetic acid which helps stabilise blood sugar. It also assists liver in removing toxins. Kombucha as a natural probiotic helps your body remove toxins and keep good bacteria. It also has a special probiotic which cannot be killed by antibiotics. For many people that are trying to lose weight, drinking a tea is recommended, in particular black and green tea. Kombucha can help with losing weight by removing excess water weight in the body which is accumulated in tissues from chemical-laden foods and alcohol. 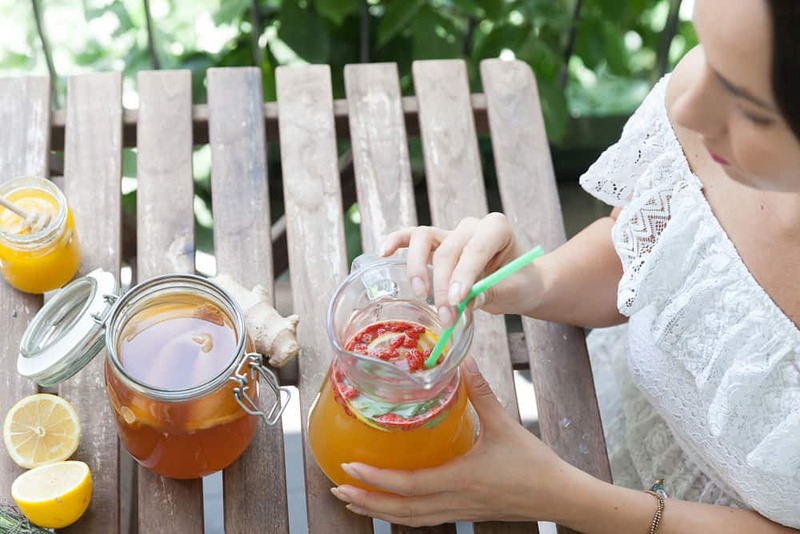 It is important to note that kombucha is not classified as a medicine, however, many people around the world claim that kombucha is a natural probiotic which contributes to their gut and digestive health. In summary, making kombucha at home is relatively easy especially if you get one of the kombucha fermentation kits. Is everything listed in the kit included? Is SCOBY fresh (not past its expiry date)? Are the step-by-step instructions clear and easy to follow? If you have any doubts contact the supplier directly or search the Internet to find your answers. Fermentation community is large and there are many fermentation enthusiasts out there who are willing to help. We would love to find more about your kombucha journey. Have you tried a kombucha fermentation kit and what was your experience like?